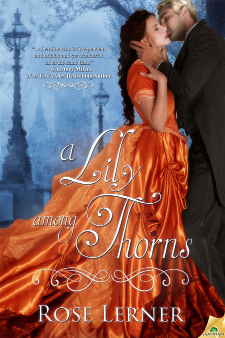 A Lily Among Thorns Re-release! You guys. Today marks the re-release of one of my all-time favorite historicals! Rose Lerner's wonderful A Lily Among Thorns has been out of print (woe, desolation) ever since the Dorchester fiasco. But, happily, Samhain picked it up and re-released it in ebook form with a few minor revisions and a new cover. A paperback edition will follow next year. For the curious, you can read the prologue and first chapter here. And for the even curiouser, you can read my original review here. As I frequently remark, Ms. Lerner's characters are people I would want to know and keep in my life. And Serena and Solomon are my very favorites. To celebrate the re-release, Rose has posted a free tie-in short story featuring Solomon's little sister and her husband. She's also running a Lily gift basket giveaway. So be sure to stop in to check out all the fun goodies. Yay!! I think I added this to my to-read list even before I first started reading romance. Something about it just called to me and I've wanted to pick it up. Good news indeed! That is a Good Life Choice, Heidi. What is the time period of this book? The old cover makes it seem so Austen-esque, but orange dress doesn't quite scream regency era! Yes, the old cover really did give off that Austen vibe. The new cover is a bit more accurate, I think. And, you know, I mislabeled this. It's Victorian era, not regency. Solomon's brother fought in the Napoleonic Wars.